The notes and sounds made by a piano are the result of strings vibrating. The strings vibrate when they are hit by a hammer within the piano. The piano has 88 keys all of which play a different note. Multiple keys can be played at the same time to create chords and harmonies. What happens when you hit a key? When you press a key on the piano it causes a small hammer inside the piano to hit a string or strings. 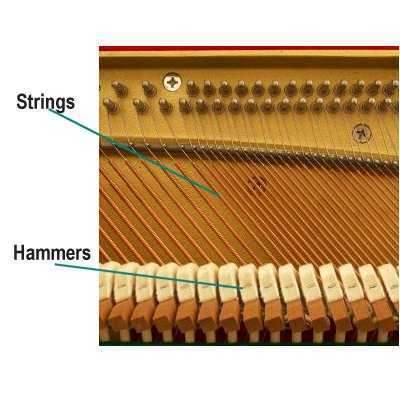 Each key is connected to its own hammer or hammers which hit a specific string or number of strings. When the hammer hits a string, it vibrates and makes a sound that is tuned to a specific note. The vibration of the string is then passed on to the soundboard located just under the strings causing it to vibrate and resonate. The soundboard gives each piano its own unique sound and also helps to amplify the sound (make louder). In addition to the hammer, there is also a damper. The damper is covered with a felt pad and keeps the strings from vibrating when they are not being played. When you press a key the damper is lifted from the string to allow it to vibrate. When you release a key, the damper moves back onto the string to stop the vibration. Even though there are 88 keys on a piano there are more than 88 strings inside it. A typical piano may have as many as 230 strings. This is because many of the high notes have 3 strings, some lower notes have 2 strings, and the very low notes only have 1 string. Pianos generally have two or three pedals that you work with your feet. The right pedal is the most commonly used and is called the damper or sustaining pedal. It raises the dampers from all the strings when you press on it allowing notes to be continue (or be sustained) even after you release the key. The two pedals to the left can have different functions depending on the piano. The leftmost pedal is generally called a soft pedal. It moves the hammers to allow the music to be played a bit softer. It may move the hammers closer to the strings or a bit to the side. The middle pedal generally lifts the dampers for the notes being played at the time. It may also just lift the dampers for the low notes. It depends on the piano. A piano is a very complex instrument. There can be well over 50 parts for each key and a grand piano may be made from over 7000 total parts. The working portion of the piano is called the action. The action of a grand piano is considered superior to that of an upright piano due to its design. The action of a grand piano allows a note to be played faster than with an upright. Different strings in the piano have different thicknesses to get different notes. Low notes have thicker strings. The hammer actually releases from the key right before it hits the string. This allows it to hit the string and bounce off it. Otherwise it may stay on the string and would end up damping it.